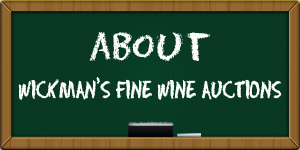 Distinguished by innovation and driven by passion, Wickman’s Fine Wine Auctions has been a lively and profitable meeting ground for wine buyers and sellers since 2003. A family business based in South Australia, Wickman’s prides itself on its position as a reliable resource with a well-spring of extraordinary values and opportunities. Over the years, Wickman’s has continued to launch unique initiatives in an attempt to set the company apart from traditional online wine auction websites, introducing guaranteed provenance into Australian wine auctions and holding regular wine tasting events and dinners for its members.